In Carl Sagan's book Pale Blue Dot, he argued that humans evolved a love for exploration as an essential part of our survival as a species. It was this evolutionary trait which compelled our hunter-gather ancestors to leave their home—Africa—when times were getting rough and to meander across the planet. As planetary catastrophes become increasingly likely as time rolls by, Sagan argues that this same "survival strategy" will perhaps compel humanity to colonize the solar system, and beyond. Even the universe itself will one day become too dangerous for humans to live in and we’ll need to voyage to another universe to survive. 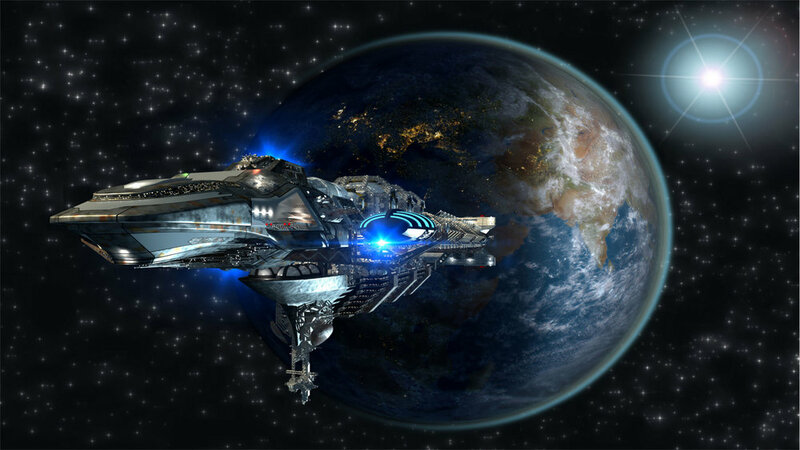 The Kardeshev scale ranks how advanced a technological civilization is based on its power consumption. A Type I civilization is a civilization which has harnessed all of their planet's renewable energy sources and who can control the natural forces of their planet such as the weather and volcanoes; a Type II civilization has harnessed the total power output of their home-star and routinely move and dissemble stars; a Type III civilization is one which has spread across the entire galaxy and harnessed the total power output of their galaxy; a Type IV civilization is one with faster-than-light (FTL) speed spacecraft and that has harnessed the total power output of all the galaxies in their universe; Type V civilizations are like gods which have colonized other universes and can spontaneously create other universes at will. In this article, we discuss Moon colonization: the best spots to build infrastructure on the Moon; the advantages of going there; how the Moon's resources could be utilized; and the prospect of an immense lunar city. The extraordinary Carl Sagan long ago envisioned in his book, Pale Blue Dot, humanity eventually terraforming other worlds and building settlements on the asteroids and comets in our solar system. He imagined that these little worlds could be perhaps redirected and manuevered—used as little rocky "space ships"—in order to set sail for the stars. In this article, we discuss some of the techniques which could be used towards this telos. Terraforming a world just means to make it more Earth-like. In this article, we'll discuss various techniques which have been proposed by scientists and engineers that would make Mars more like our home planet. We shall also discuss a potential scheme of future events which might occur as humans terraform and colonize Mars. The lack of oxygen in Mars' atmosphere and running liquid water on its surface is very inconveniant for any humans living their since oxygen and liquid water are necessary for humans to survive. Fortunatelly, there is an abundance of frozen water on Mars' surface. In this lesson, we'll discuss various techniques which can be used to extract all of this water. Once the water is obtained, by performing electrolysis on the water we can distill all of the oxygen from that water we need. After humanity has colonized and begun terraforming Mars, the next likely destination would be Saturn's moon Titan. One of the drawbacks of Mars is that it lacks nitrogen which is needed to grow food and also to create a breathable atmosphere. Enormous aerostats or NIFT spacecraft could harvest nitrogen and other resources from Titan's atmosphere and then transport these resources to a nuclear propulsion spacecraft. Given that Titan's gravity is only one-sixth as strong as that of the Earth's, we could use Titan's indigenous resources to construct a space elevator where nuclear propulsion spacecraft could be launched from. These spacecraft would carry their payload to Mars and, after arriving, all of that nitrogen could be deposited into Mars' atmosphere. It would also be very useful to send nitrogen to the Moon and to settlements along the asteroids in the inner-asteroid belt where nitrogen could be used for growing food. And after settling Titan, humans would likely go on to harvest helium-3 (which could be used to power nuclear fusion spacecraft) from Saturn and the other gas giants in the solar system which will be used to power nuclear powered spacecraft to the Kuiper belt, the Oort cloud, and perhaps even to the stars.. The first serious proposal in scientific literature on terraforming other worlds in the universe was about terraforming Venus. The planetary scientist Carl Sagan imagined seeding the Venusian skies with photosynthetic microbes capable of converting Venus's \(C0_2\)-rich atmosphere into oxygen. Other proposals involve assembling a vast system of orbital mirrors capable of blocking the Sun's light and cooling Venus until this hot and hellish world became very frigid and rained \(C0_2\) from its atmosphere. The solleta would also be capable of simulating an Earth day/night cycle. To create oceans and an active hydrosphere on Venus, we could hurl scores of icy asteroids from the Kuiper belt to Venus and, upon impacting the Venusian atmosphere, would rapidly disintegrate releasing enormous quantities of water vapor into the atmosphere which subsequently condense to form the first seas on Venus. Or perhaps Saturn's moon Enceladus—containing a colossal subsurface ocean dwarfing that of the Earth's—could be sacrificed towards the end of creating the first seas on Venus. But even if humans never terraform this hellish world, they could still live their—partially at least—by deploying thousands of blimps into the Venusian skies capable of supporting a long-term, human presence of perhaps over a million people. Venusian sky cities. But eventually, after many millennia of terraforming Venus, a rich ecosystem of life—including us—could live on Venus's surface. The icy asteroids and comets in the Kuiper belt will one day (perhaps during the 22nd century) be hurled towards Mars’ atmosphere where they’ll disintegrate and release nitrogen into the atmosphere—a crucial step in the project of terraforming Mars. In the future, asteroids will perhaps be used as spaceships powered by nuclear reactors. The fuel for these nuclear reactors—deuterium and helium-3—could be harvested from the asteroids and the atmospheres of gas giants, respectively. As the famous physicist Freeman Dyson once noted, since the Oort Cloud contains all the ingredients necessary to support life, this realm of a trillion or more comets will likely be a way point for a long voyage to the Alpha Centuari star system. 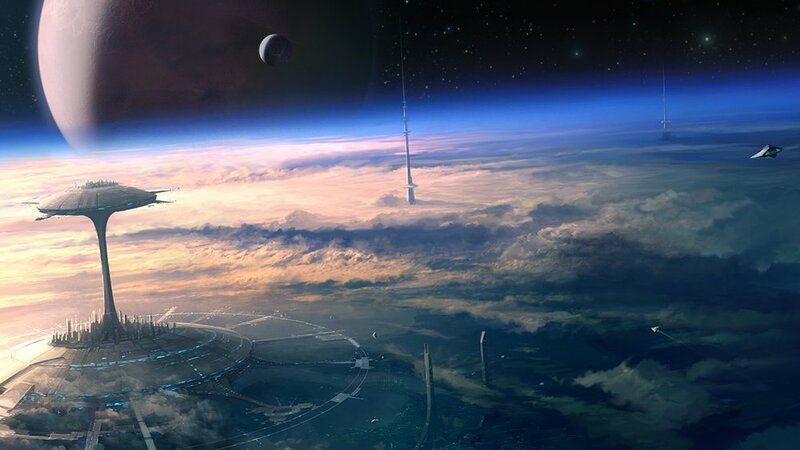 An orbital ring connected to the Earth by space elevators would reduce the cost of going to space to an amount comparable to an airplane ticket. This would cause a boom in the space tourism industry and eventually millions and even billions of people and tons of cargo will be moving from the Earth’s surface to space annually, and vise versa. This would necessitate an expansion in our space-based infrastructure to include space-based solar panels, a lunar mass driver, the routine mining of asteroids, and especially enormous space habitats (for all those billions of people to live in) such as the Standford Torus, the Bernal Sphere, or the O’Neil Cylinder. Orbital rings also allow you to build artificial planets and Dyson spheres, which would allow us to completely colonize the solar system. They would also allow us to build a Birch planet, a single planet with a surface area which exceeds the total surface area of all the planets in the Milky Way galaxy. This article is essentially a “teaser” of what we have in store for upcoming articles. Basically, I summarize ideas that will be discussed in tremendous detail in subsequent articles. These ideas are, primarily, interplanetary travel, interstellar travel, and intergalactic travel and how megastructures like orbital rings and star lifters (and a few others) will enable such voyages. We also give a very brief “teaser” on the redesign of the social and economic systems which underlie all industrial and social protocol. In this article, we discuss preliminary interstellar missions which will serve as preludes to missions involving sending spacecraft to stars. We primarily discuss using the Sun as a gravitational lens - a kind of “cosmic telescope” - to search for exoplanets which likely harbor life as well as those which likely do not. In this article, we’ll look at various different ways we could travel to the stars. We’ll first discuss how very small, but very fast probes could be accelerated to relativistic speeds using lasers (or masers); such probes could reach the nearest stars within the span of a human lifetime. This discussion will also lead us to the notion of an “interstellar highway” which we’ll discuss in detail. We conclude by discussing how asteroids and comets could also be used as spaceships to reach the stars. In this article, we’ll discuss star lifting and orbital rings and their applications to interstellar and intergalactic space travel. In this article, we’ll talk in laymen terms about quantum theory and general relativity and, specifically, how the two are related. We shall begin by discussing the well-known fact that these two theories—which describe how the universe works on the scale of the very small (quantum theory) and the very large (general relativity)—oftentimes contradict one another and they usually contradict each other on the scale of the very small (which is where general relativity breaks down and quantum mechanics gives us the correct picture). Now, something that is a little less well-known is that quantum theory and general relativity seem to, in some strange sense, make similar predictions about how nature is on vast size scales. Both theories predict that there are other universes and extra spatial dimensions. We shall close our discussion in this article by answering a question that we posed at the end of the article, Orbital Rings and Planet Building. In this lesson, we'll give a friendly introduction to what nuclear fusion is and how it might be used by space faring civilizations. A Shkadov thruster is a type of megastructure which involves constructing a gargantuan orbital mirror next to a star. In this lesson, we'll start off by discussing how such a stellar engine works. The orbital mirror is placed in a position next to a star where it acts as a statite: that is, the star's gravity acting on the mirror is canceled out by the star's radiation pressure acting on the mirror. This allows the mirror to stay in a position that is stationary relative to the star's surface. The mirror bounces some of the star's light back at itself; when that reflected light collides with the star, it exerts a thrust on the star which causes it to accelerate and move. This will bring us to the second main focus of this lesson: namely, what are the possible uses of a Shkadov thruster? As we'll discuss, since a Shkadov thruster can move the star and since all of the planets, moons, comets, and asteroids in the star system is gravitationally bound to the star, not only does the star move but the entire solar system moves away also. In the distance future, our Sun will eventually die. But we might be able to use a Shkadov thruster to move the Earth to another solar system, but this would take many millions of years. In this video, we’ll discuss Shkadov thrusters: a method of moving stars, star systems, and even entire galaxies. A spaceship using an Alcubierre warp drive would involve assembling a ring of negative energy around the spaceship which would distort spacetime in this particular way: the spaceship sits in a "bubble" of flat, Minkowski spacetime which is "pushed" by expanding space behind it and "pulled" by contracting space infront of it. The spaceship does not move through space, but rather space itself moves and carries along the spaceship for the ride. Since general relativity places no limit on how fast space can move, the space can "carry" the warp bubble and spaceship away at faster than light (FTL) speeds. This article will represent the beginning of a new series in which we look at the future of technology and how it will impact our civilization. In this article in particular, we’ll talk about the potential impacts of room-temperature superconductors and we’ll also discuss the history of technological revolutions and how they enhanced our biology over the course of millions of years. This will lead us to a concept coined by the cosmologist Max Tegmark called “Life 3.0.” We’ll discuss how the third industrial revolution will differ from all other prior technological revolutions in that it’ll produce technology which will allow us to enhance the functionality of our own biology. Superconductors are the key to unlocking the future of transportation and electrical transmission. They enable the most efficient approaches to these industrial processes known to present science. A maglev vehicle, to borrow Jeremy Rifkin's wording, will shrink the dimensions of space and time by allowing distant continental and inter-continental regions to be accessed in, well, not much time at all. But superconductors also offer unprecedented efficiency: they eliminate the problem of atoms colliding with other atoms and would allow vehicle to "slide" across enormous distances with virtually no loss of energy and it would allow a loop of current to persist longer than the remaining lifetime of the universe. Much of the damage accumulated in the components of vehicles can, in some way or another, be traced to the friction against the road; maglev transportation circumvents this issue. Li-Fi was invented in 2011 by professor Harald Haas and is a form of wireless communications technology which would allow us to transmit information and data at least 100 times faster than Wi-Fi. Even more significantly, Li-Fi is essential—and in fact, it is necessary—for us to transition to a Third Industrial Revolution (TIR) infrastructure where everything in the environment—from buildings, roads, and walkways—becomes "cognified." This article will be the beggining of a new series in which we examine the effects that artificial intelligence (AI), robots, and automation will have on human civilization. In this article, we’ll primarily be focusing on the implications of artificial general intelligence (AGI). In this article, we’ll speculate about what the world will look like in the year 2100. We’ll discuss things like robot chefs, virtual and augmented reality, and transhumanism just to name a few; we shall also, briefly, allude to a discussion on living on Uranus’s moon, Miranda. As the title suggests, in this article we’ll be talking about the future of robotics, AI, and automation. We’ll have pretty detailed discussions on driverless vehicles (which can be thought of as robots), agricultural robots, manufacturing and construction robots, and retail robots. We’ll also briefly talk about things like nanobots and some of the kinds of robots we could use in space. We’ll also have a discussion about “big numbers” and the kinds of weird quantum effects that we’d expect to occur over long time intervals. Lastly, we discuss the scientific possibility of the holy grail of Star Trek - universal assemblers. Undoubtedly, if our wisdom and foresight rises to be commensurate with our science and technology, the future of humanity in the 21st century is Utopian. We will have re-engineered the surface of the Earth with cities, transportation and communication systems, and new energy infrastructure which are designed and constructed to have optimal efficiency according to known science. We will have also spread across much of the solar system and, perhaps, have sent robotic spacecraft off to the nearest star system, Alpha Centauri. Aside from re-engineering the Earth and other worlds in our solar system, we will also likely re-engineer ourselves as we merge with our technology and machines. This will be the subject of discussion in this article. Get the latest lessons, news and updates delivered to your inbox.